Action – Film. Politics. Pop Culture. Get Out is a marvel of a movie in an age where explosions and VFX are the main magnets that pull popular audiences out and into a comfy multiplex armchair. On the surface, both in the trailers and in the first act build-up, it’s a story about characters and social interactions. It plays off cultural stereotypes and commonly misused/abused racial phrases, contrasting some very real and at times shocking attitudes without pulling any punches. Yet it all seems too on the button, too hyper-focused and self-aware to be a movie that’s just about a family not accepting their daughters black boyfriend. And it’s not just that; there’s much more to it. Daniel Kaluuya plays Chris, an excited but hyper-nervous boyfriend. He leans on his girlfriend, Rose, played by Allison Williams, helping to ease her worries through cute jokes and quips. Rose’s innocent, red-cheeked demeanor feels like a sort of android or human replicant that acts exactly like a stereotypical white college girlfriend acts. She’s way too accommodating to him; there isn’t any real drama between the two of them, only love and kisses, smoke and mirrors. The films marketing campaign focused heavily on the concept of a white young woman bringing her dark-skinned, African-American boyfriend out to the families farm estate. The advertisements didn’t reveal much about the intricate plot details. With a very reasonable budget of 4.5 million, the producers of Get Out were hoping that, as a hybrid 2017 horror movie, the film would work best as a word-of-mouth product as opposed to releasing it in a more traditional manner through relentless TV marketing. The studios certainly didn’t need to buy big TV ad spots in the end. As of mid-April, Jordan Peele’s horror film has grossed an impressive 184 million. With overwhelming critical approval and praise, as well as the instant name recognition stemming from Peele’s hit show, Key & Peele, the film’s producers had very good reason to take a step back and let the quality of the movie speak for itself. Director Jordan Peele has always professed a love for horror films, good or bad or atrociously bad. He has also expressed his fairly unique perspective on race. Peele is a half black man raised by and growing up alongside a predominantly white family. A major part of Get Out involves small interactions between Chris and Rose’ parents’ white, country-club friends. These encounters are sometimes staged bluntly for comedic effect or in a more subtle manner to help build ambiguity and mystery. At times, the social satire veers towards being a bit too transparent, such as when the father, Dean Armitage, played by Bradley Whitford, insists to Chris that he would definitely vote for Obama for a third term, if he could. A white man complimenting an African-American man on his “prowess” or “muscular strength” may appear to be a compliment at face-value, but those on the receiving end of the compliments clearly feel uncomfortable. They feel like they are being evaluated. It’s as if their body and entire being are being mentally measured and weighed for current or potential value, similar in a way to the extreme scouting tactics used on young, pre-teen athletes. The story arc comes and goes without any lingering moments dragging down the fast-paced narrative. The first half introduces us to the characters and scenarios, giving the audience time to think about the direction of the story, to ponder about the potential twists and turns. Peele buys himself enough time in the first half of the movie to convince the audience that we know what kind of movie we’re watching, only to have the rug firmly pulled out from under us in the final act. Some of the plot points don’t entirely add up, though I won’t go into spoiler territory. I think It’s important, though, to think more about the social and cultural messages rather than the labyrinthian, complex narrative. The story details don’t 100% hold up upon multiple viewings, but the entertainment value remains the same. There’s plenty to talk about, and part of the fun is seeing it with someone for the first time and helping them fill in the pieces to the puzzle. Compared to the multitude of uninspired and unoriginal horror films being punched out these days, Get Out should get an oscar nom. Overall, Get Out is a thoughtful look at race relations in America. It’s both funny and bleak in the way that it shatters stereotypes that people still commonly use to this day. A piercingly bold and occasionally frightening ride through the eyes of a young African-American man. The first thing I thought walking out of the theater is that this movie is either innovative or disrespectful; there is no hiding the fact that liberties have been taken with the entire genre in the new Tony Stark vehicle. Without giving away any spoilers, if you look at the one liberty (and those who’ve seen it know exactly what it is), and judge it solely on it’s merit and the merit it had in the comics, you’re going to call it disrespectful to the origins. But if you look at how it fits into the whole plot and schema of the movie, it’s a very clever device. The movie is about identity and accountability, and of all the character flaws shining through Tony Stark, no-one can deny he’s not afraid of being known and being accountable. Indeed, that was the whole moral conundrum that resulted in him de-weaponizing his whole company in Jon Favreau’s first Iron Man movie. And then he goes and makes a public statement to a terrorist, even blurting out his home address (though it’s surprising that by now everyone doesn’t know where the great Tony Stark lives, especially an international terrorist). The new Iron Man does have a boat load of humor, courtesy of “Kiss Kiss Bang Bang” director Shane Black. But don’t let these cover-up the depth that aches beneath the surface. Tony Stark is living anxiously after the events of the Avengers. The anxiety-attacks could have been a little better written, maybe with hallucination or more of his pain shown alongside visuals. Robert Downey Jr. looks wide-eyed and breathes heavily throughout the film. And although he’s a great actor, there’s just not enough built-in or earned emotion for us to feel a whole lot of sympathy; and just imagine how difficult it might be for a viewer who hasn’t seen the events of the The Avengers. Some of the greatest scenes in the movie come in the form of a young boy Tony finds in a small-town. Their personalities are very similar and it results in a lot of spark on-screen. They quip, talk about fathers, and help each other out in a charming, big brother sort of way. The remote-controlled armor is an odd duality. 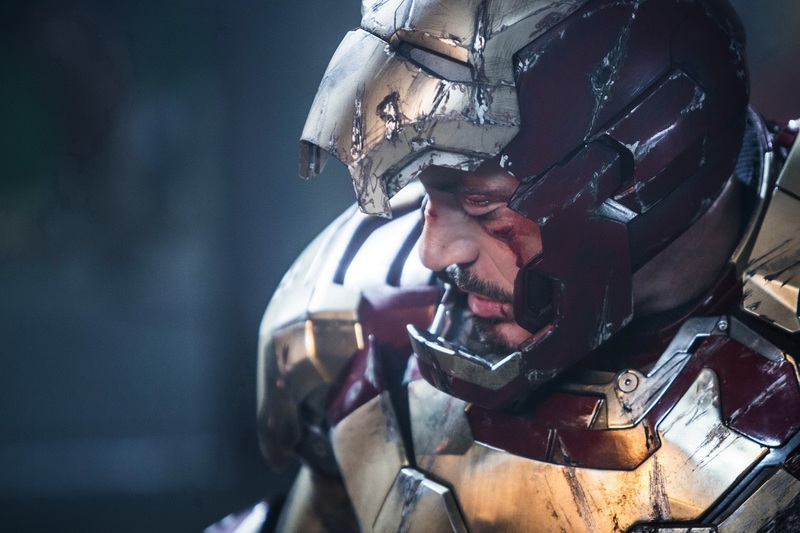 The movie’s premise promotes the idea that Tony is Iron Man, Iron Man is not Tony. It’s an inciting moment for Tony’s third-act epiphany; he has gone too far. He builds a boat load of armor, his technology commanding a bit too much of his attention. The movie is an interesting exploration of the old theme of man-or-machine, even if the climax may be a bit overlong. The explosions never really end in the climax and the lack of quiet moments spliced in between the chaos creates a numbing affect. The repetition of the action sequences simply normalizes the barrage of fireworks. It goes off the rails, falling into the default mode of a standard superhero showdown.